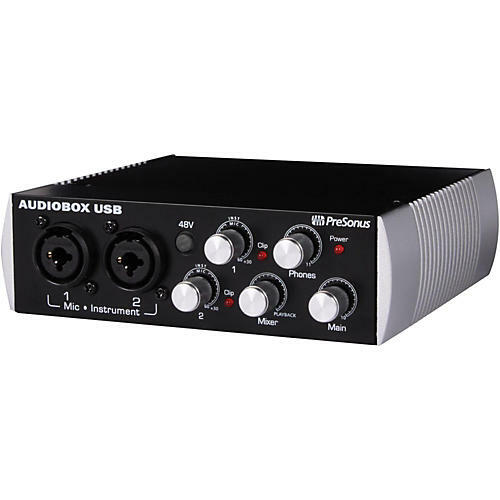 The PreSonus AudioBox USB 2x2 USB recording system is an excellent solution for achieving high-quality, professional-sounding recordings no matter where you are. The AudioBox USB is a USB bus-powered audio recording interface loaded with 2 microphone/instrument inputs with 48V phantom power, two balanced TRS outputs, and MIDI I/O so you can stay portable without sacrificing your sound. The AudioBox USB also comes with Studio One Artist music creation and production software which has the same platform and intuitive interface as Studio One Pro but with an unlimited track count so you can start recording right out of the box. PreSonus Audio has won numerous awards for designing quality microphone preamplifiers for all price levels. The AudioBox USB is loaded with preamps that deliver high headroom, low noise, and high gain to give you pure, full, and rich sound. Most USB recording devices operate at a 16-bit sample rate and use converters with dynamic ranges of less than 90dB which gives you a pinched and relatively small sound. The AudioBox USB, however, uses professional-grade analog to digital converters with a dynamic range of 102dB and 24-bit sample rate so that the digital conversion is big, quiet, and musical, making it one of the best sounding USB bus-powered interface on the market. The AudioBox USB is bus-powered giving you the flexibility you need with no wall warts, line lumps, or power cables. Just plug in to a powered USB port and you are ready to record. The AudioBox USB is housed in an all-metal chassis with metal knobs able to withstand the rigors of travel and your touring adventures. Just toss the AudioBox USB in your laptop bag and mobilize your music creation and production. Whether you're recording your shows, creating a mix on the plane, or writing songs in your hotel room, the AudioBox is ready to go.